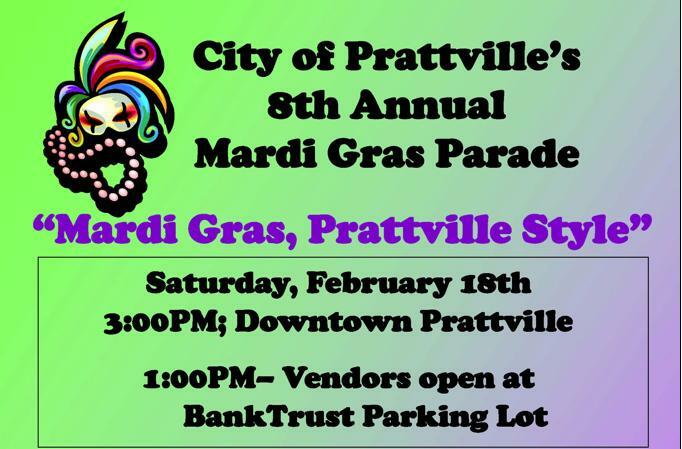 Due to the chance of severe weather on Saturday afternoon, the City of Prattville has changed the time and route of the 8th annual Mardi Gras Parade. "After an update on the weather, we have made the decision to move the parade from 3 p.m. to 11 a.m. on Saturday," said Kellie Cook, Special Events Director. "The heaviest and most severe weather is schedule to hit after lunch, so we are hoping we will still be able to have our parade. We are changing the route to help ensure we will get done before noon." Local vendors will begin selling beverages and food, at 10 a.m. at the Partners in Pediatrics parking lot, located next to Bank Trust in downtown Prattville. The parade route will be as follows: begin at the Autauga County Courthouse, follow straight through downtown on Main Street, right on Northington Street, with the parade ending at Stanley Jensen Stadium. We will continue to monitor the weather closely and if we see that the threat of severe weather is issued for the entire day, we will plan to cancel the parade. Please watch our home page or our City Facebook page for the latest updates. For more information, call the Special Events Office at 358-0297. 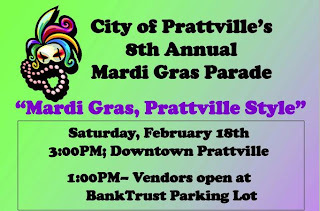 The City of Prattville's 8th annual Mardi Gras Parade is scheduled for Saturday, February 18th. The parade themed "Mardi Gras, Prattville Style" will roll out from the Autauga County Courthouse at 3:00 p.m. and wind its way through the streets of downtown, with plenty of beads, candy and MoonPies for everyone. Local vendors will be selling beverages and food, beginning at 1 p.m. at the Partners in Pediatrics parking lot, located next to BankTrust in downtown Prattville. A children's fun area will be set up as well. FYI: The parade route will begin at the Autauga County Courthouse, turning left on 4th Street. The entries will then turn left onto Washington and right on Wetumpka Street. The parade will then turn right on Northington Street and continue to Main Street, where the entries will continue through the downtown area. The parade will end at the Autauga County Courthouse.